Today is horribly hot and humid but it was a short day so all the dogs are now cooled down and relaxing in the shade. The second Nursery class ran today and an Open Ranch class. June and Reba got some schooling in their classes today but even with that, they managed to pull off some placings. 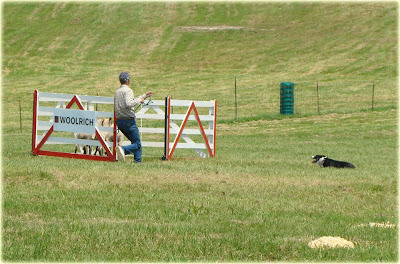 June got a 69 in the Nursery class and took 3rd place but had some trouble in the Open Ranch with her outrun. She tends to take off from Scott's side before he sends her and he is trying to break her of it. In the process, he didn't have her set up exactly right for a good outrun and she needed some shouting out. Tam needed some redirects on his outrun in the nursery but had a nice fetch and the start of a good drive but the terrain confused him a little and he ended up retiring. Reba and Scott looked like they were going to win the Open Ranch class until Cy Peterson (Reba's owner) ran Kellee (who Scott trained over the winter) and they laid down a run good enough for an 82 and the win! Yea Cy and Kellee! Today's shining star was Bracken! She needed a couple of redirects on her outrun but then had a sweet lift and marched them along on their drive. She got a 69 which was good enough for second place and her second leg for the nursery nationals! We didn't have much cloud cover today. It was mild in the morning but got hot and heavy humidity within a few hours of starting. Our course today was a left hand outrun and a shed, pen, single. Hemp drew up 10th and it should have been a good time but despite his good outrun he was hard to hold today. He had a great shed but took one too many steps at the pen and we had one of those older wily ewes who just ran around the pen. I got them in the mouth several times but Hemp just couldn't take a one step flank. He had to take two or three steps. When it was obvious I wouldn't have time to finish, I retired. 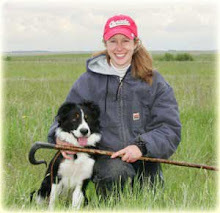 Debbie Bailey and her two dogs Huck and Camp set the bar early with a score of 102. Scott wasn't keen on being left out of the top 10 yesterday so he and Don made sure that didn't happen again with a 105 to take the lead and keep it all day. It was a precise and controlled run. Don looked great, even in the heat. Lad and I ran a few hours later. Today Laddie ran a clean outrun, if a little wide and took care of his top end himself. I didn't blow a whistle to him until he was just in front of the fetch panels where he had a little bobble. There was another little bobble on the way to the drive away panels because the hearing was off in that area but after that Lad moved the sheep very well. Good shed, easy pen and good single for a 103! 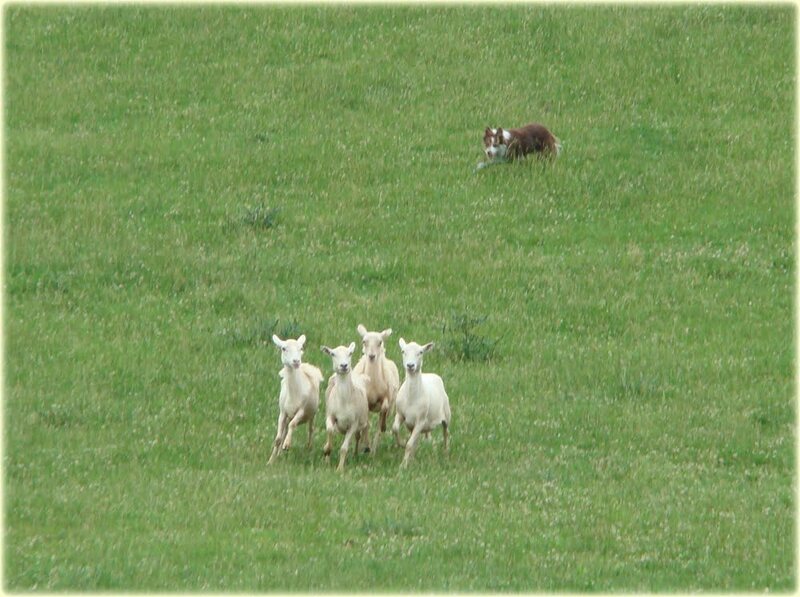 Maid had a great run with not much off until her drive away when her sheep got a little jumpy and a quick flank shot them up the field. Scott retired after that because with such high scores, that was already out of the money. 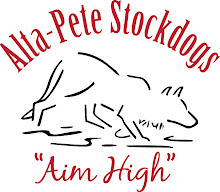 Christine Koval and Tweed continued their hot streak with a 102 and Bruce Fogt and Cam are really starting to blend as a team and got second place with a 104. This qualified Bruce and Christine for the double lift (2 day combined scores). Debbie's Huck also qualified and Camp's combined score tied with Christine's so he also made the double lift. Christine had some bad luck with a ambulance driving by on the near by road at the time of her turn back. Her dog never got the sheep to the post because he couldn't hear her but he turned back anyway and fetched the second set. Unfortunately, she was disqualified for never bringing the first set to the post. Debbie's Huck had a very nice drive but in the end, Bruce and Cam completed the course and won the double lift. The open started out nice with a cloud cover that made the first half of the day cool. The last half of the day was another story with heat and humidity. Maid was not on her best behavior today. She needed a shout out on the outrun and then the top 1/4 of her fetch was erratic. She settled down by the time she got to her drive and made all her panels but had a missed attempt on her shed. She got her pen fairly easily. Laddie ran next and it was just starting to warm up. He also had trouble with his outrun and got lost. He ran too wide then he started to come in early (it looked like he too wanted to bring me the pony in the next field). When he got to the top, his sheep had left a little early and he didn't immediately straighten it out. Finally he got on line and had a nice drive even though I tried very hard to screw up the crossdrive panels. Fortunately, Laddie saved it and then had a nice shed and penned with no help from me. He ended up with a 76. Donnie ran when it got hot. 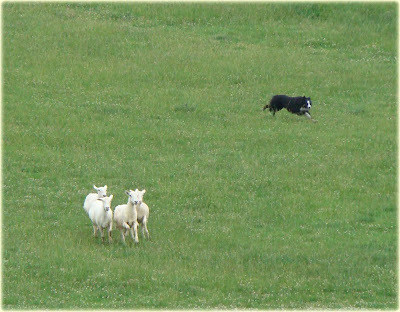 His outrun was flawless but he took a little bit of time settling into the sheep. It wasn't a smooth run but the lines were good and he made all his panels. He had a difficult lead ewe and they were not easy to shed. It took a long time to get a gap but when he came in it was nice. 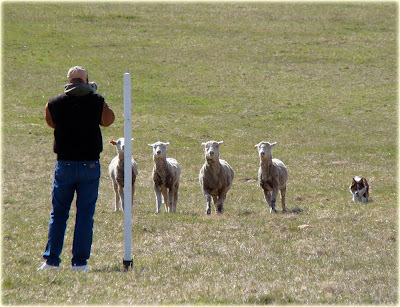 After that, the sheep were done and wouldn't let hot, tired, Donnie catch them at the pen (many of the older ewes know just what to do to keep from being caught). Time was called before they completed the pen. Our surprise good run of the day came from Hemp. Yes, you heard me right. Hemp. In the heat. 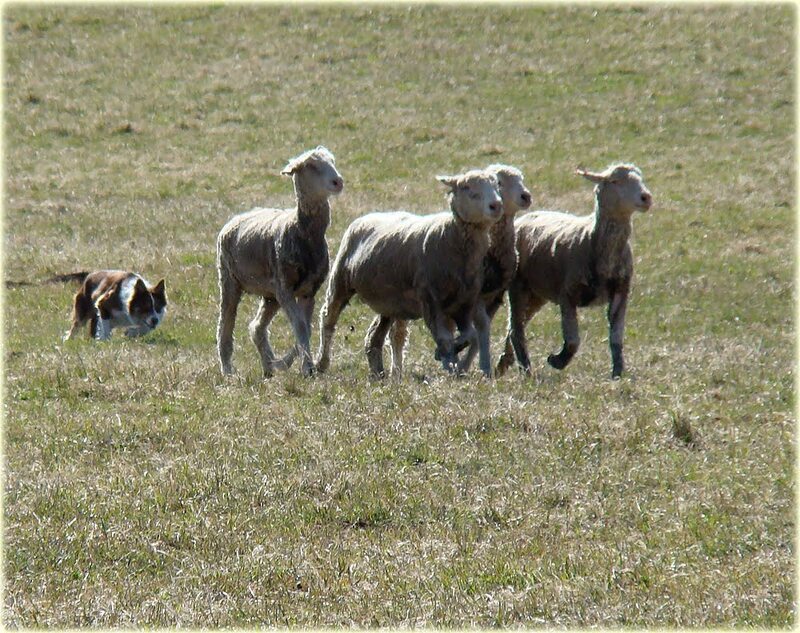 I won't say he was perfect (but his outrun was), but we were better and with the sheep being broke katahdins, I wasn't scared to ask alot from him. On the third leg of the drive he started acting up by not stopping and flanking as well, which was probably due to getting a little hot but when he got to the shedding ring I could see he wasn't that bad and he could finish. He came in on his shed and then we went to the pen. 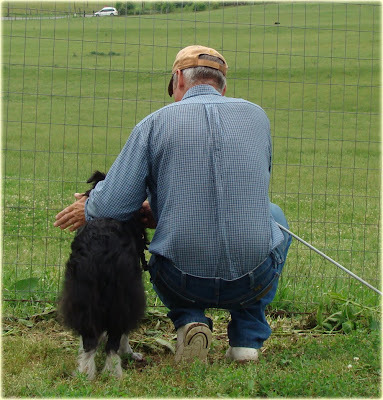 I kept him well out of it - I let Lad do his pen by himself but with Hemp's history of slicing at the pen when he was hot, I did as much of it by myself as I could and closed the gate with an 87. 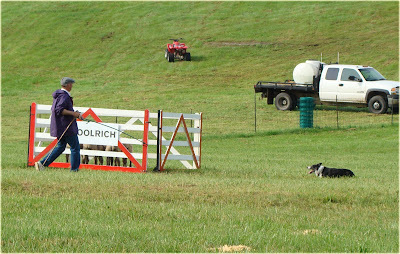 The best run of the day was Debbie Bailey's Huck(le Berry Hound) who laid down a smooth one for a 93. It's been a long time since we have been to the North Carolina State Championship, otherwise known as Dr. Ben's, and we are glad to be back. When we were last here, Laddie was 9 weeks old and Donnie's father still lived in Ireland and Don wasn't even a twinkle in his eye. Now we are back and hope to do as well as the last time (Scott won it with Pleat). Today, Friday, was just nursery. It started out very warm but a nice cloud cover cooled everything down as evening approached. 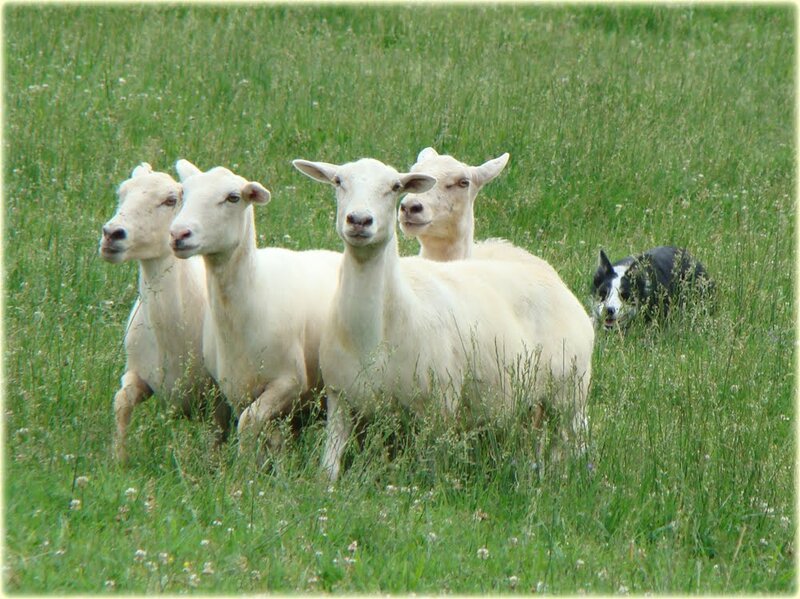 The sheep are katahdins and the field is a terraced hill that confuses most of the nursery dogs. 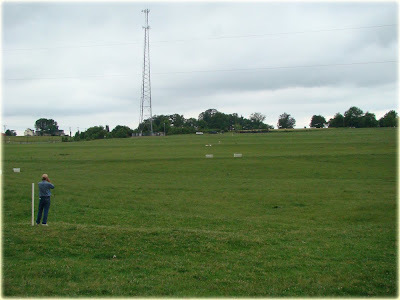 Add to that a pasture on the right hand side with some donkeys and a pony that distracted some of them. Tam saw the pony and crossed over to try to bring it to us. 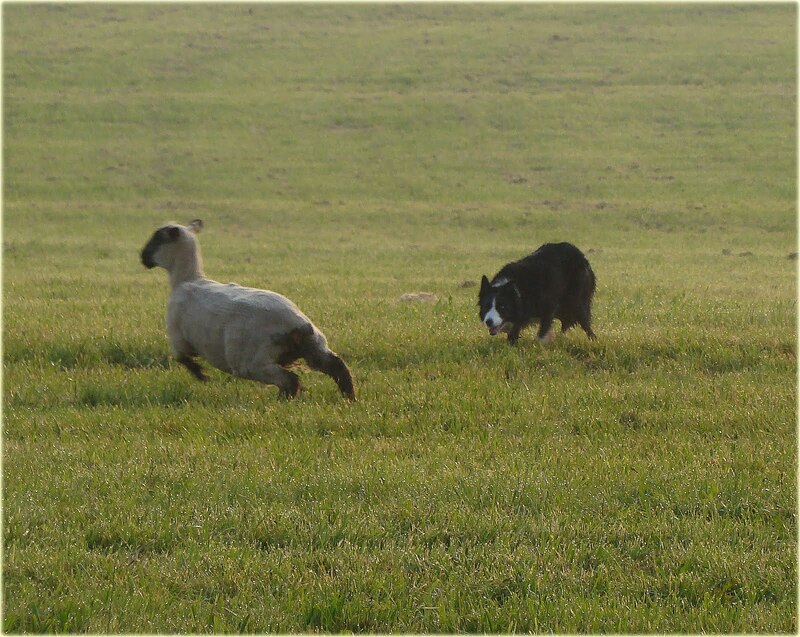 After he got to his sheep, he ran one of his best runs but unfortunately, he also had a difficult pen with the sheep outrunning him around it. Bracken was outstanding, with the exception of her outrun. She was sent to the right, but she also tried to bring the pony in the neighboring pasture. When she realized she couldn't get to it, she followed the fence line all the way up and then came down the field to get her sheep. 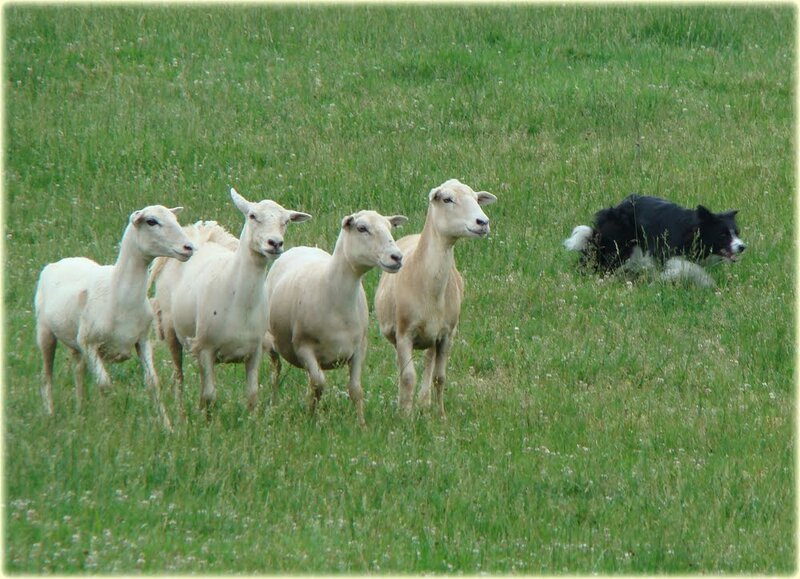 She couldn't see them because of the terraces, but Scott's whistles got her to them and then she walked them as nice as could be around the field. Even with her bad outrun, she got a 67 and a 7th place. Reba also looked great today. She needed one shout out on her outrun and then she too walked them around with one bobble at the pen. She received a 77 and 3rd place. Our star was June. 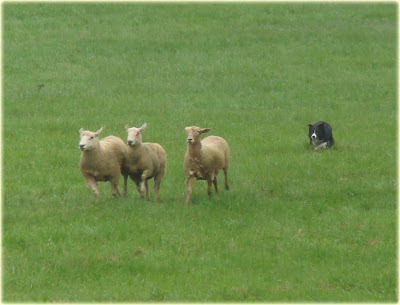 She had a clean outrun to the left and a little craziness on her first couple flanks on the fetch but then settled down and, pretty as you please, moved those sheep and penned them right up. She won it with an 81, and got her second nursery leg! Tomorrow we run open and pray for less heat and humidity. 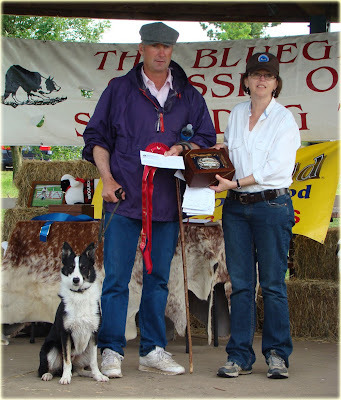 So you know by now that Alasdair MacRae and Star took the day, with Star's son, Don, and Scott in reserve (yet again a bridesmaid) and Tricia Macrae and Max not too far behind for 3rd place. 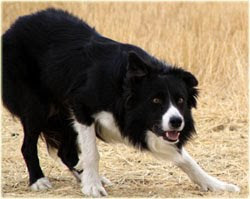 Scott would just like to say that he really thought he had a perfect line on his first fetch until he realized he was just a smidge too low to make the panel. On everything else, he and Donnie did very well and even got a perfect score on the international shed by all 3 judges. It was rough going on the final day of the nursery field. 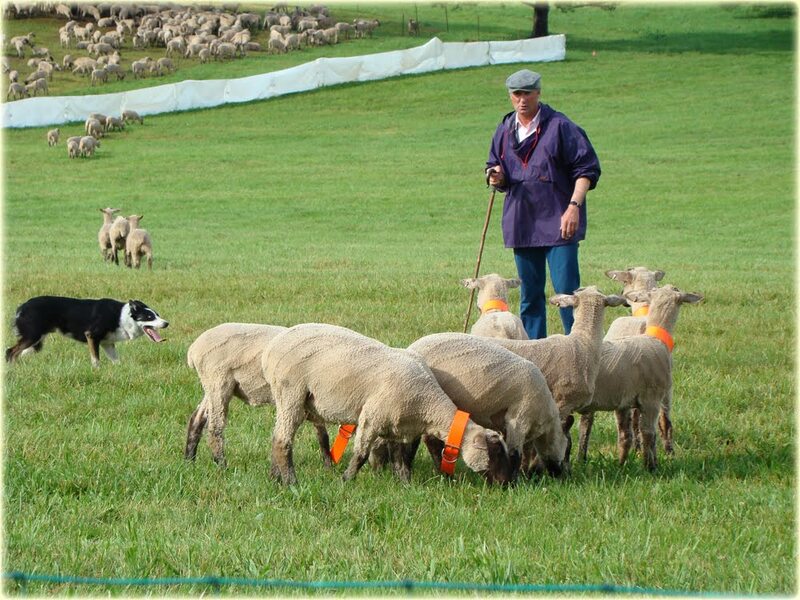 They have been switching two different flocks of sheep every day and this was the day of the running sheep. Tam, June and Bracken had terrible runs but you can't really blame them. 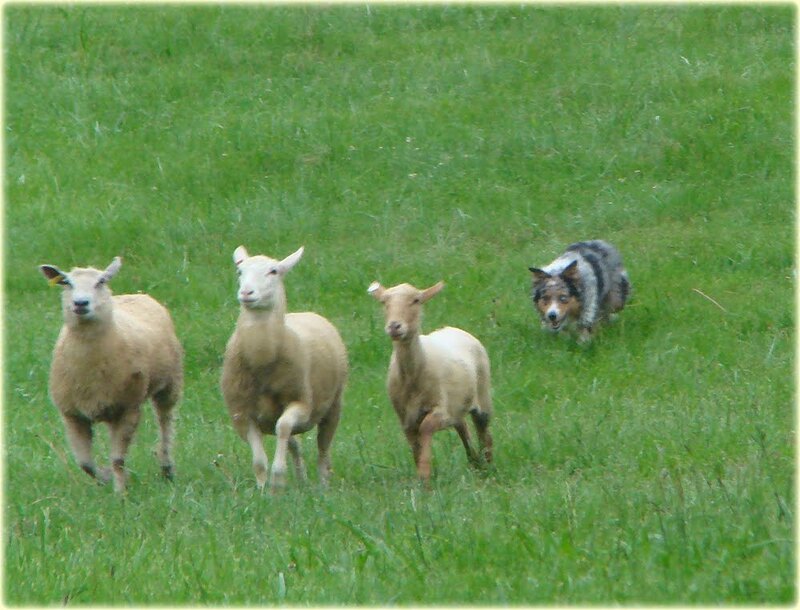 Along with Reba, their solution was to try to get wider to slow the sheep down. Not only did this not have any effect on these sheep, but the field is not wide enough for them to get off of them. 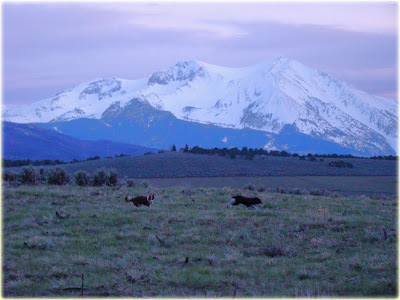 Later in the day, things got better and June laid down a nice ranch run. They had let us know that during the second round of the open they would be calling you off if there was no chance for you to either make the double lift, get USBCHA points or get day money. We have been running behind every day and they need to make up that time so they can be finished this evening for the double lift tomorrow. They didn't do too many call offs yesterday but today they are sending people away, right and left. so they had to re shed before they could finish their pen. Donnie ran in a terribly hot time. He didn't get a great draw either. They made him have to do alot of fast flanking while they constantly ran to try and escape. 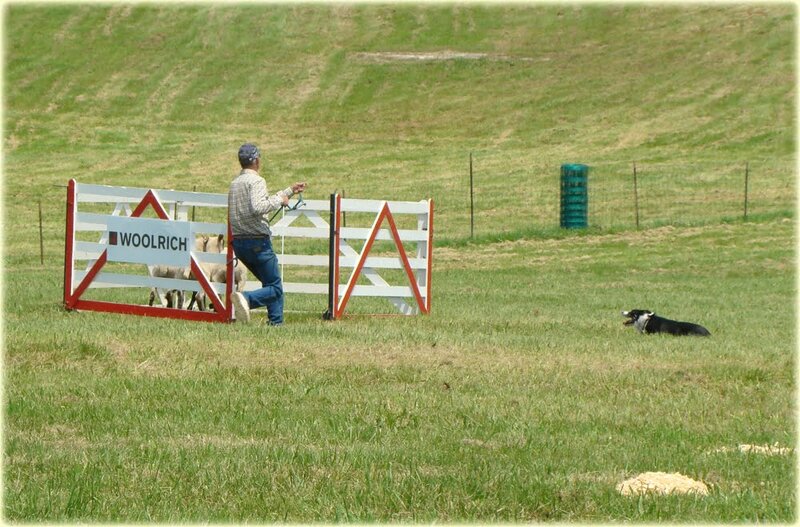 He made his fetch panels and had GREAT turn on the drive panels but then lost them way high off line. He got them back on around the fetch gates and the rest of the drive looked good. When they got to the shedding ring, he was exhausted and hot. Unfortunately, the sheep had no intentions of settling down. 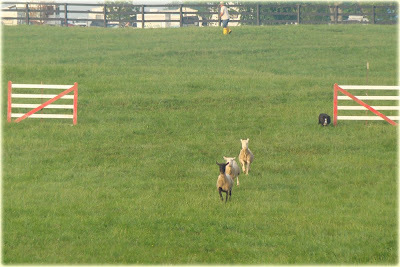 They continued to race around, getting out of the ring twice. Scott was finally able to take the first one on the head. They regathered and took their time at the pen. 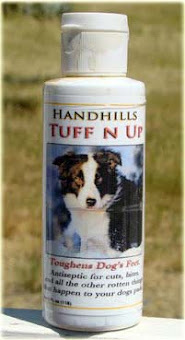 Many dogs have lost their dogs at the pen to the exhaust in the past couple of days. Donnie wouldn't have anymore left in him if he had to go get them again so Scott made sure they had a straight line and put them right in. The final score was an 80. I would think that would be well in. There have been ALOT more 80s in this final round if you drew up at a cooler time (sometimes a nice cloud comes over for a little while and it really helps) but since he has a 90 from yesterday, he should be fine. A couple of other notable runs today : Alasdair MacRae ran Star (Donnie's mother) and as usual he made it look easy and scored a 91. Lyle Lad was the only one to threaten to top that (at this moment we still have a few hours left) and after she had a beautiful run - only 4 points off to the pen- she lost them behind the pen and they ran to the exhaust with Shep hot on their heels. Shep grabbed one hard and they gave her a DQ. Don't forget to keep checking the scores on the Bluegrass website and plan on watching the webcast live tomorrow! I'm sorry that I didn't blog last night - I was a little sad and we decided to go out to my favorite Mexican restaurant (if you know me, you know I'll never pass up Mexican food because Alberta doesn't have any!). Donnie ruled the day. He scored a 90 and won the open but it wasn't as easy as it sounds. 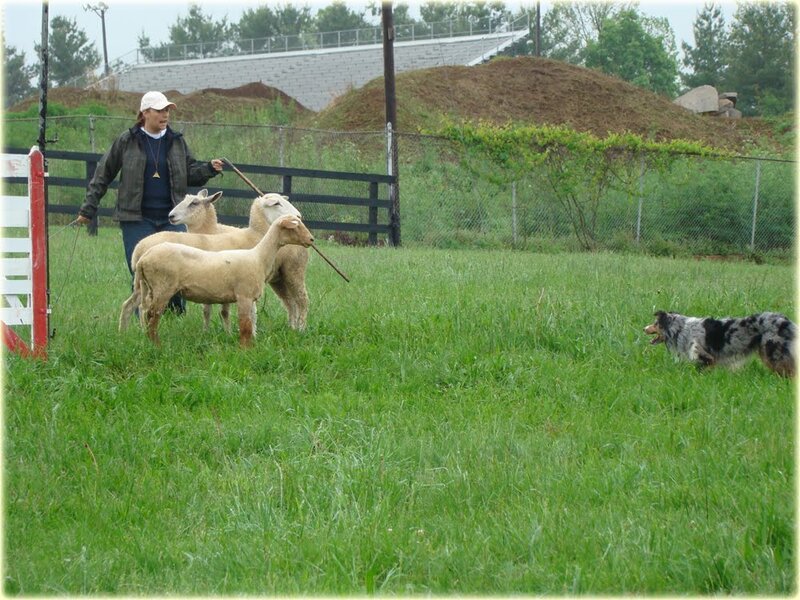 He actually had a headstrong ewe who didn't want to play nice and he really had to work to keep her in line. He will run his second run on Saturday so we'll keep our fingers crossed that it's good enough to put him in the double lift - his mother, Star, handled by Alasdair MacRae, took second to Don in the first round. Laddie had a decent run. Unfortunately, he thought he heard me whistle him down on the outrun and he stopped like a good boy. I don't know what it was but there are some birds around here that sound just like a down whistle. It lost him 6 points but he finished the outrun and had a nice lift after that. He brought them down nicely and had to put up with my wobbly lines. In the shedding ring, he was getting a little frustrated with the sheep and he tried to "bite" one (Lad doesn't really bite them unless they attack him but he's been known to chest bump one and get called off) but I yelled LIE DOWN and he just stopped dead in the middle of the sheep. It looked like a missed attempt and we lost alot of points. His second shed was fine and he got a nice pen with a 77.5. I was worried about running Hemp again so Scott told me to run him with flow instead of line. I did and he did fine although we missed our panels but I thought things went well. He got his shed but he completely imploded at the pen. He had got himself hot in the head and just wouldn't quit slicing his flanks. 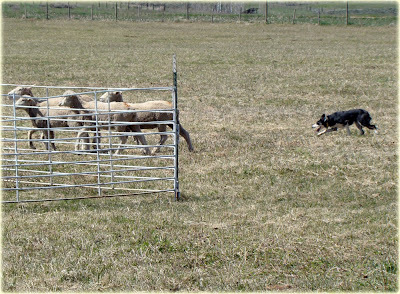 He lost them behind the pen and then lost one up the field. I decided to retire. 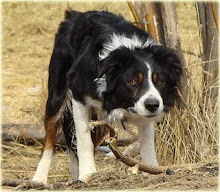 It made me disappointed because he has so much talent and he showed it on his really nice lift and fetch but couldn't keep it together by the pen. I've decided that he will be my number one work dog but number two trial dog. 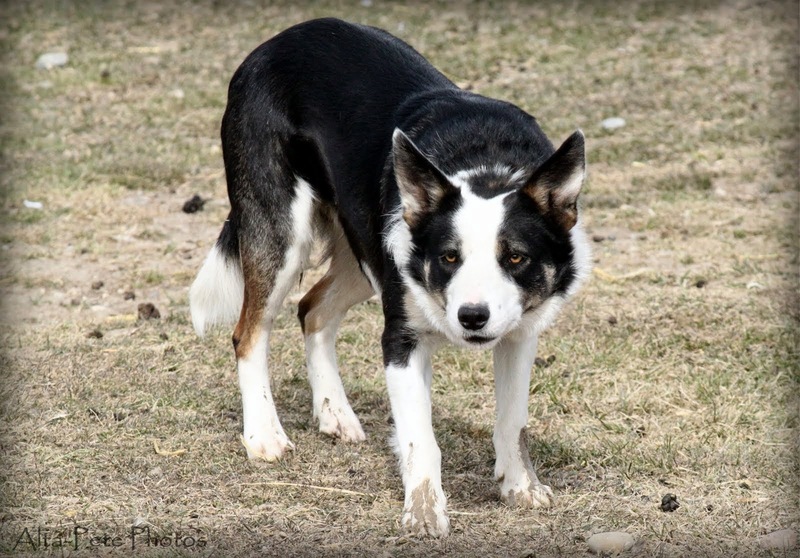 Laddie deserves the chance to shine more and I'll run him in Soldier Hollow instead. 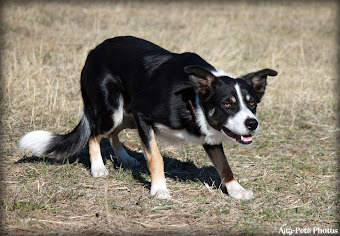 June hasn't been doing as well on the nursery field and has been disappointing us. 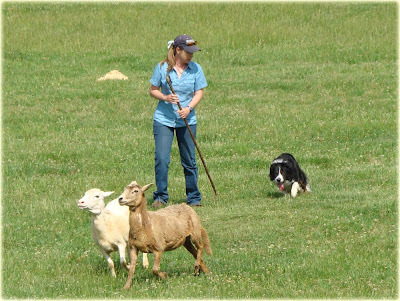 Reba had a bad run today because the sheep were really leaning on her in the nursery but she really had a nice one in the Ranch class. Tam has been struggling with his fetch and drive but today in his nursery he did really well and got a 72! Scott was proud of him. Bracken also got it together today and got her first leg in the nursery! 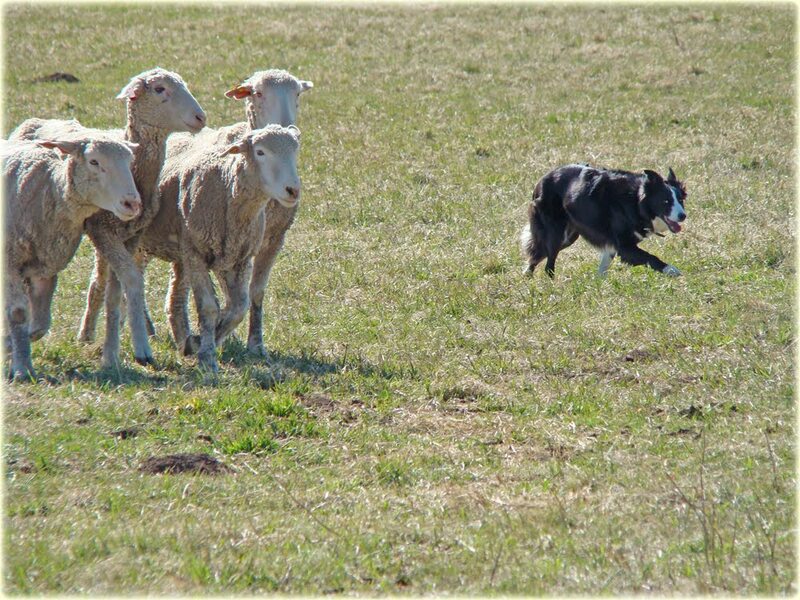 Laddie had a running sheep today and even though he finished it was very crazy. Hemp and I ran better together today. I kept my whistles light and he responded positively. The sheep were very hard to lift and actually ran from the set out to try and run him over as he was walking toward them on the lift. It was some work getting down the field but he made the fetch panels and had a very good drive away and turn. His cross drive wasn't so bad but when he got across and in front of the panel he didn't hear my softer steady and he headed them twice so I didn't try to get the panel (especially since his two big grips have been on the turn). He was pretty hot when he got to the shedding ring (It was VERY hot and humid today). We had a missed attempt on the shed and timed out. It might not have seemed like a good run but I kept it easy and he responded and I was able to attempt a decent course - even if I did chicken out in the end. I will get some pictures tomorrow - I promise! 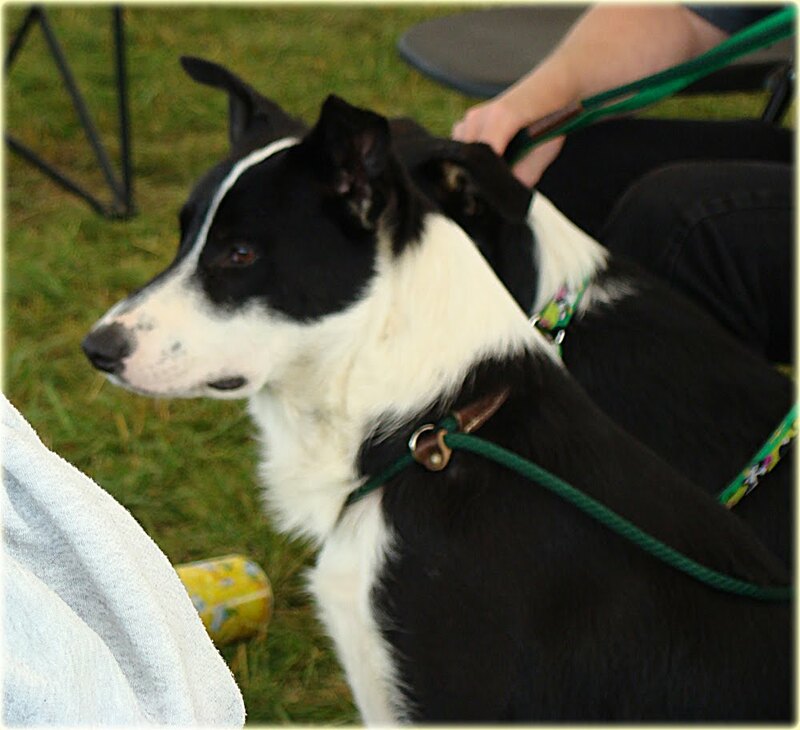 run by Scott who not only placed second in her nursery class but also got her second leg and is now qualified for the Nursery Nationals! 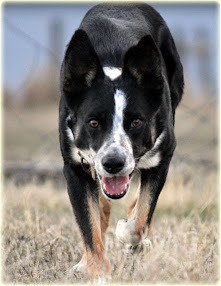 Reba needed a redirect and her first flank was difficult but after that, she figured it out and had a very nice run, getting all her panels and a good pen. Louanne Twa's Bracken, run by Scott had a rough start to her run with a crossover and then she didn't listen very well. Scott decided to throw the run to make sure she'd settle down for her next run, and he went up the field to let her know he was unhappy. 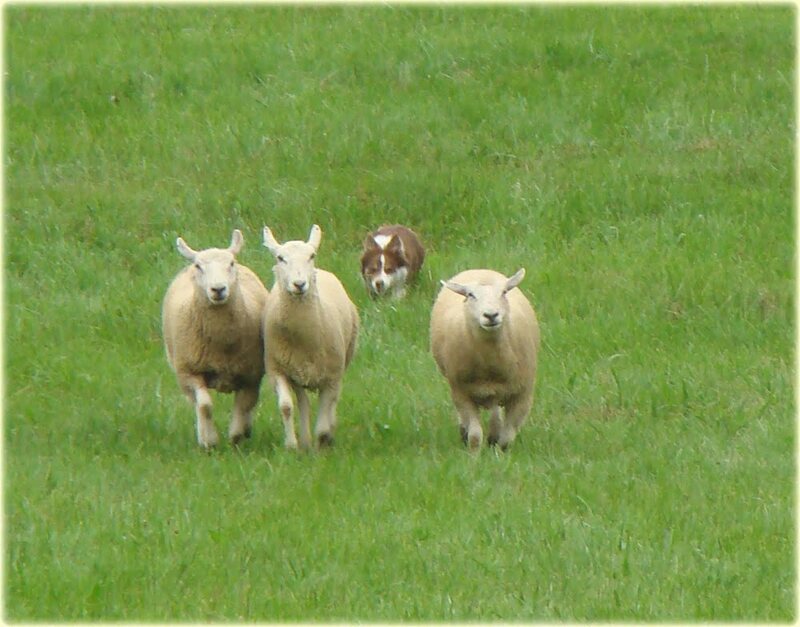 In her next run in the Pro Novice, she had a completely different attitude and had a nice outrun but had a horrible ewe who wasn't going to stay with the others. While the first two tried to walk around the course, the other ewe just wanted to stand and eat and would dodge around Bracken to stop and get some grass. 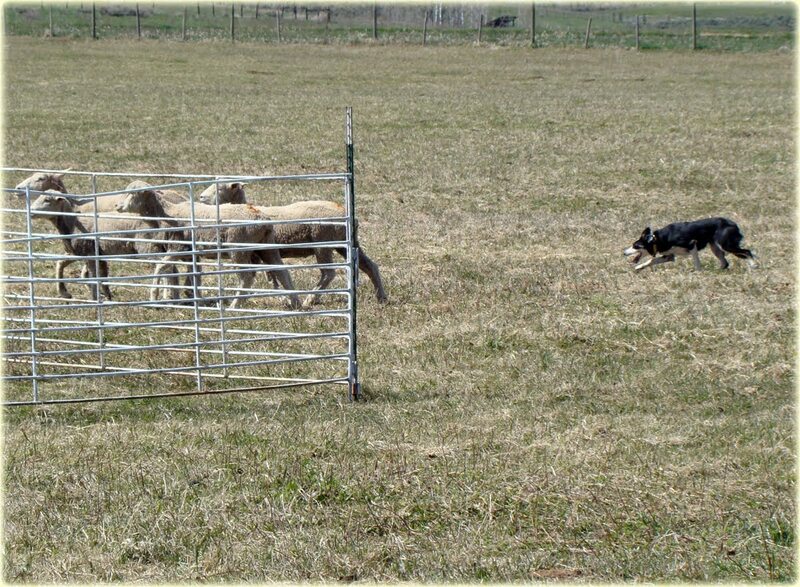 Bracken did a nice job of regrouping her but when she just wouldn't play nice after going around the post, Scott called her run. He didn't want her to get any ideas about gripping on the field. 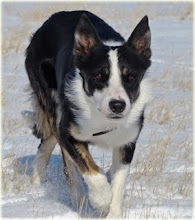 Louanne Twa ran her littermate to Bracken, Craig, that Scott trained this winter. They had a pretty good run for Craig's first trial ever and successfully closed the pen gate but didn't get a leg for the nationals yet. Scott also ran Diane Pagel's Tam. Tam crossed on his outrun but was game to try the rest of the course. 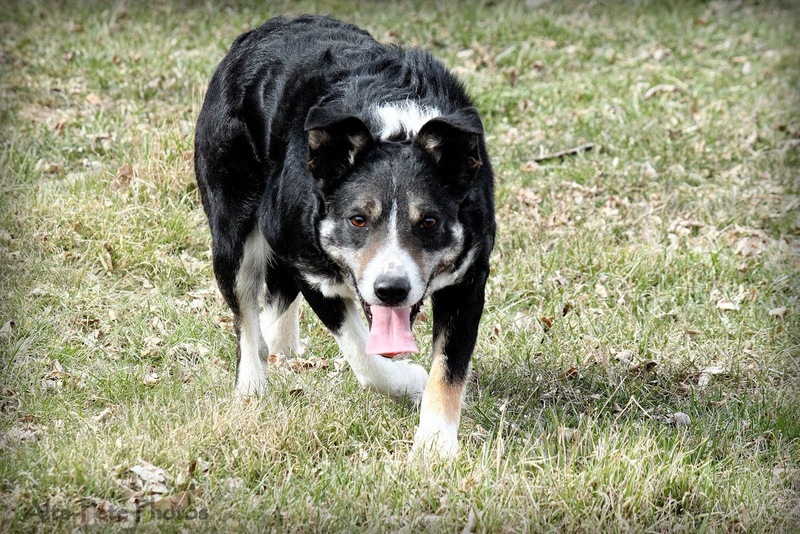 Scott trained on him through the fetch and the drive and used up most of his time before walking off. 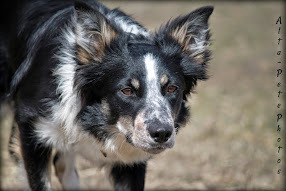 In his afternoon run in the ProNovice, Tam was better and although he struggled with his lines on the fetch and drive, he had a nice outrun so we will hope for better with him tomorrow. June did a nice job although a little speedy but I don't think she ended up getting a qualifying run. We'll keep our fingers crossed for tomorrow. Maid's run in the open was just crazy. Not that it was Maid's fault. She was actually keeping her head and staying smooth but she just had an insane set that ran as fast as they could, anywhere they could. She did her best to corral them but didn't get a single panel. She had a dicey but good shed and a pretty easy pen. With all the 60 and 70 scores, if she could lay down a good one in the next round. She could still have a chance of making the double lift. Tomorrow I run Lad and Hemp in their first round of open and Scott runs Don. 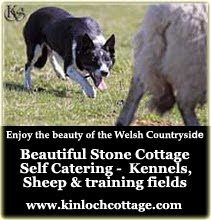 In addition, the nursery dogs will have another go and so will the Pro Novice dogs. 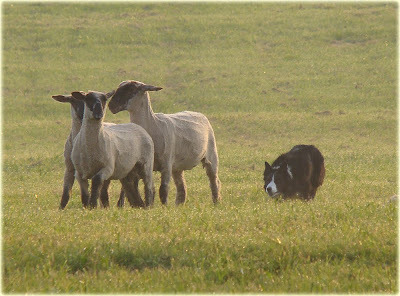 Today's weather was nicer (no wind) and the sheep became much more agreeable. The nursery dogs ran first this time and Reba really did a good job today. Scott gave her one redirect for insurance on the outrun and she had a good lift. She was a little pushy but took every flank and stop that Scott gave her. 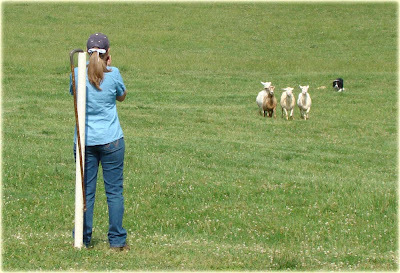 She made all her panels and did some nice work at the pen with sheep that didn't want to go in. 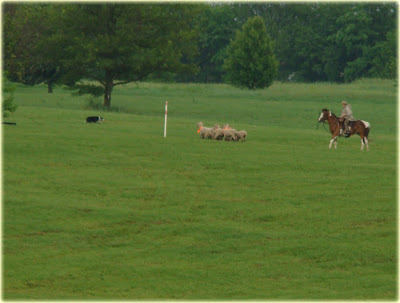 She slowed it down and kept the pressure on them but also gave correct flanks so that she didn't slice and upset them. 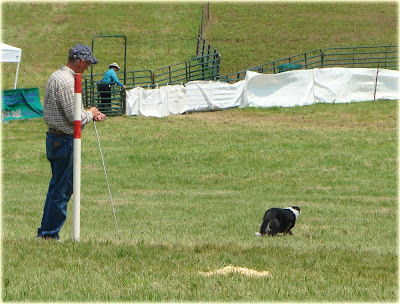 She was rewarded with a completed pen and a score of 69 which put her in 3rd place and it got her her first nursery leg! June put out equally as good an effort as Reba but she didn't have a very good set of sheep so she had some difficulty lining them out on the drive away. In the end she didn't get her pen but she still had a score of 62 and a 5th place. 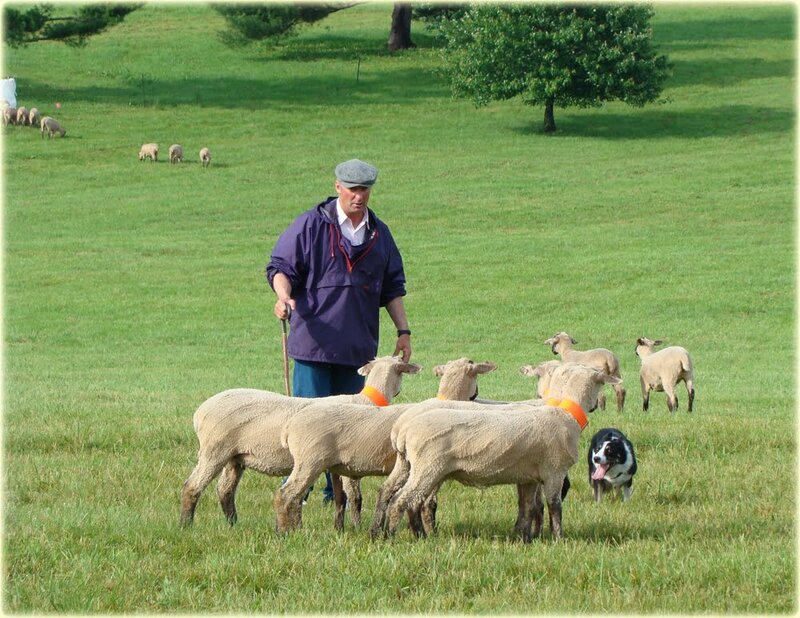 The open started in the afternoon and everyone agreed that the sheep were better but there was still 15 DQs or RTs out of 31 dogs. 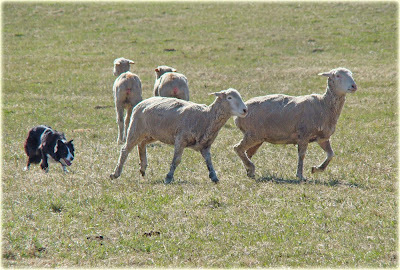 Laddie led off the class and a reversed drive helped him out today but he had one ewe that wanted to run and run, taking one buddy with her but leaving the other two to graze. 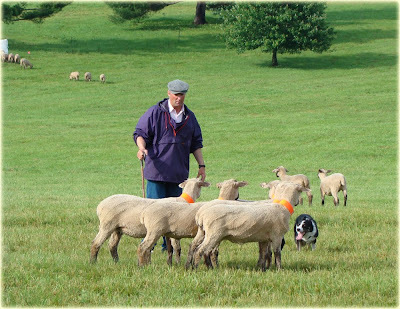 On his cross drive he had to work pretty hard stopping the first ewe and keeping her from running up the hill but then going back to goose the last two to keep them moving. 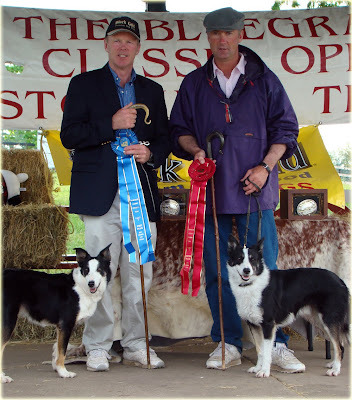 We lost them out of the ring once on the shed because of our fast footed friend but then Laddie came in nice on a shed where the sheep were running and did a nice hold (yea! that means our winter work paid off) We wouldn't have had a full point pen because Lad was slicing a little but he did get them in. 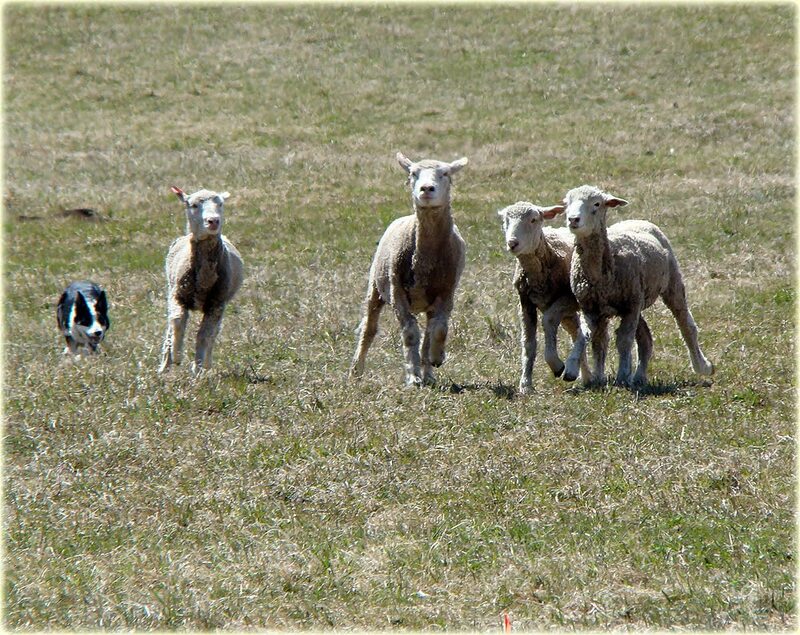 However, they were very jumpy with people and when I started to close the gate they jumped a little - having been burned by sheep running back out, I opened it up a little bit and time ran out. Laddie got a score of 70. Donnie shined today. His lift was a little rough but he settled into his usual walk and took the sheep around with great command. He had a good shed and finished with a pen. His final score was and 87, which won the class! Hemp was next. I was shaking in my boots when I went to the post because I was afraid he would grip again. It was very important for both of us to get around without a grip. I decided to keep his cool, I was going to have to give up panels and good lines. He had a great outrun and lift with no points off. His fetch was a little out to my left but I settled him down and made him flank out to straighten it. When he turned the post, I made sure I had ahold of him. Instead of lying him down, I made him "take time". He actually didn't have too messy of a drive but when we made the first drive panels, he over flanked a little bit and I decided that instead of making him do a tight flank to correct it, I let the sheep drift back through the panels. We had a decent crossdrive but he was over flanking a little to hold the top end so I had to flank him back behind them a few times. We missed the crossdrive panels just a little short and I left it to save the run since turning on the third leg has been our albatross that seems to be when he has started to explode. 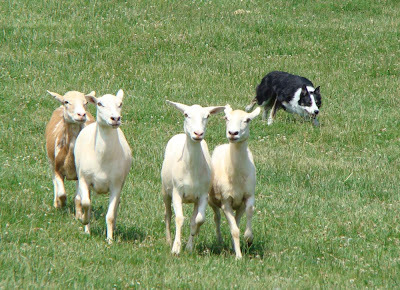 I made sure he gave ground on the next flank and lifted them nice again to bring them to the shedding ring. We had a shed set up but one sheep backed out of it so we lossed three points to a missed attempt but when I finally called him in he did a nice hold. 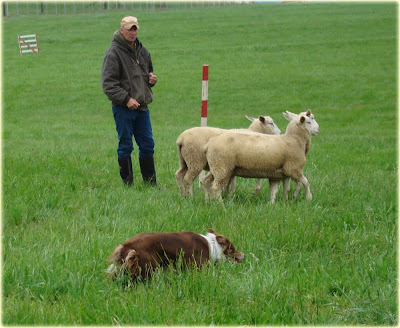 He was very good at the pen which has been a problem in the past and we would have had a good pen but, like Laddie, I just didn't get the gate shut in time, despite the fact that the sheep were in. His score was a horrible 58 but he and I both feel better about ourselves. Maid started her run a little crazy. 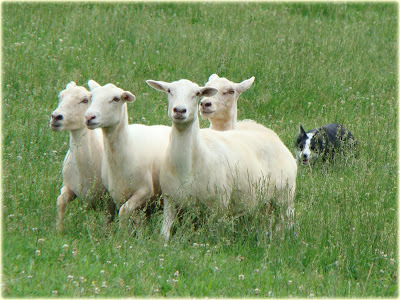 The wind had come up and unsettled her and the sheep. Her fetch was rough but by the time she was at the post it settled down. She took a wrong flank on the crossdrive which is very unlike her but several people had been having trouble in the same place and it's believed that the hearing was off. She was a little pushy in the shed but got it done and had a nice pen. She got a 78 and ended up in 3rd. NOTE: The reception here is not enough for me to load pictures. I will add them later. The Strang Ranch is absolutely beautiful, surrounded by snow capped mountains. 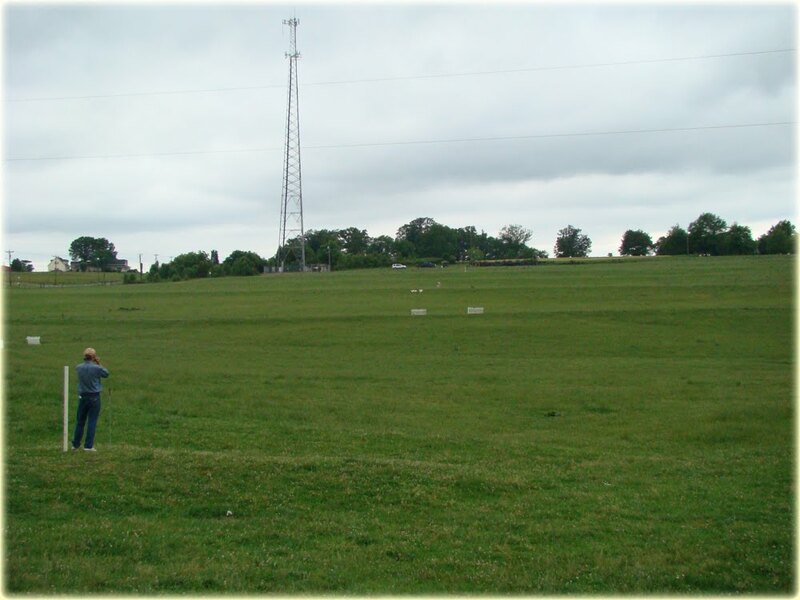 We arrived last night and surveyed the trial field. This field is not the same as the one that will be used for the Nationals (but I got to look at that one and it's really nice) but is a nice little course with good sound, even when the wind was in your face. The sheep... well, the sheep ate the dogs for lunch. 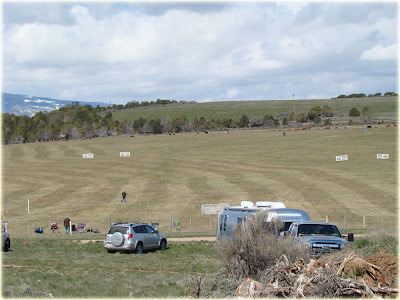 They are mostly yearling range sheep and were probably some of the most difficult I have ever dealt with, with the exception of last year's Soldier Hollow. Maid ran early and did a very nice job. 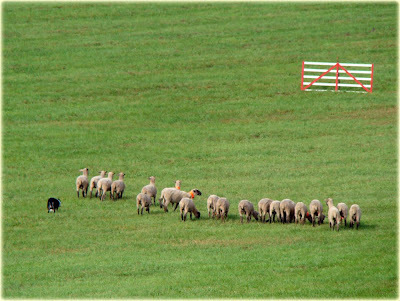 Many many people had to leave the post or had drive's all over the place due to the lambs wanting to run back to set out. Maid had pretty nice lines though and made all her panels. She got her shed with only seconds to spare and got no pen. Despite that she got an 83 and won the day by quite a bit. There were others who got around but I believe there was only one pen and that was by the second place handler, Sonia Craig with her Walt dog. 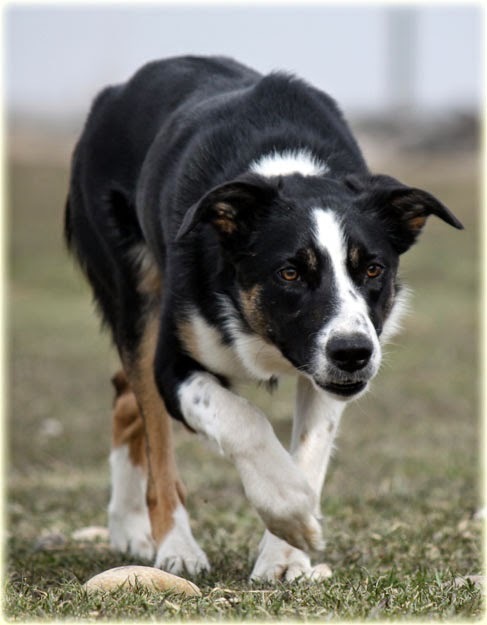 Laddie had a nice lift and missed his fetch panel by only a little bit and his lines started well. 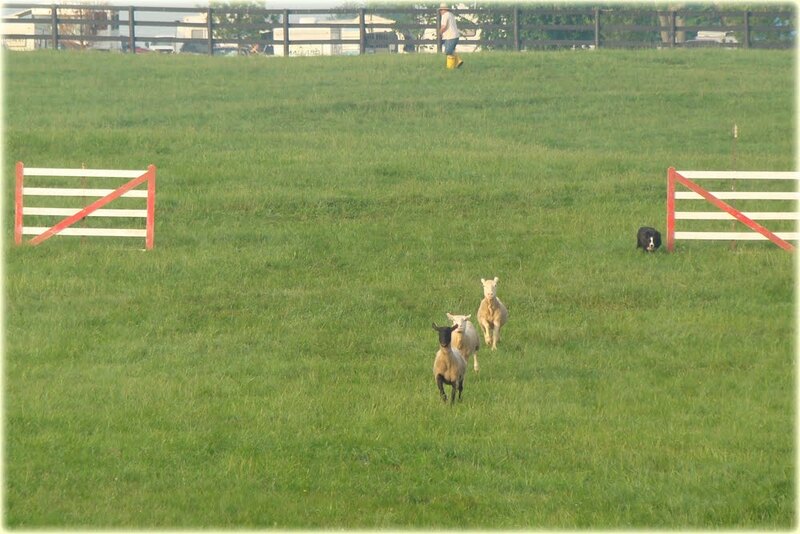 After he rounded the post his lead ewe ran as fast as she could up the field. Lad got them stopped right in front of the drive panel and instead of taking my comebye to save the panel, he took a little away and pushed them to the other side. 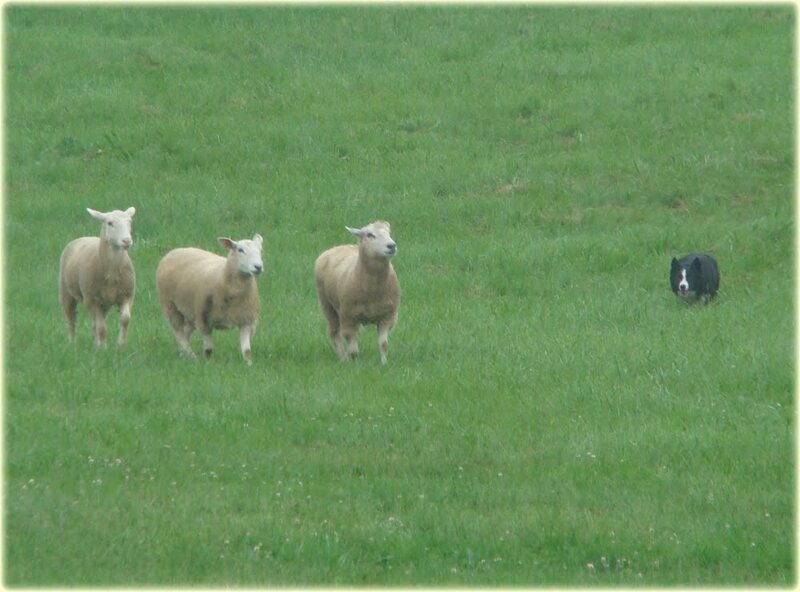 After that the sheep wanted nothing more than to run back to the set out and Lad stopped them a couple of times but then he just quit trying and let them get back so I called him off. Don ran in the afternoon when the sheep were even worse (15 out of 31 dogs retired) He had a rough lift but started to get it straightened out when Scott flanked him. He didn't realize that the sheep were starting to split and Don ended up heading them which made them run back to set out so Scott retired. Hemp. Oh, Hemp. We almost had it but it ended in a terrible disaster. He had a great outrun and nice lift. Just missed the fetch panels and made the drive away panels. The sheep were fighting him but he was doing so well and was running better than I had ever had him with these tricky sheep but after he missed the crossdrive panels, I attempted to get him back on line and he had had it with these sheep leaning on him. He grabbed one on the hock and would not let go and would not let go and would not let go. I ran up the field and he still held on. I was so surprised, because other than last year's Soldier Hollow, Hemp never gripped and when he did, he didn't hold on. This time he didn't let go until I was about 10 feet away from him and then he woke up and let go and ran away from me, realizing that he'd done wrong. I have to say, I'm afraid to run him now. I don't approve of grips and even though the sheep looked fine with no wounds or lameness, it was quite savage. I will be running him scared tomorrow and that isn't any way to run a dog. 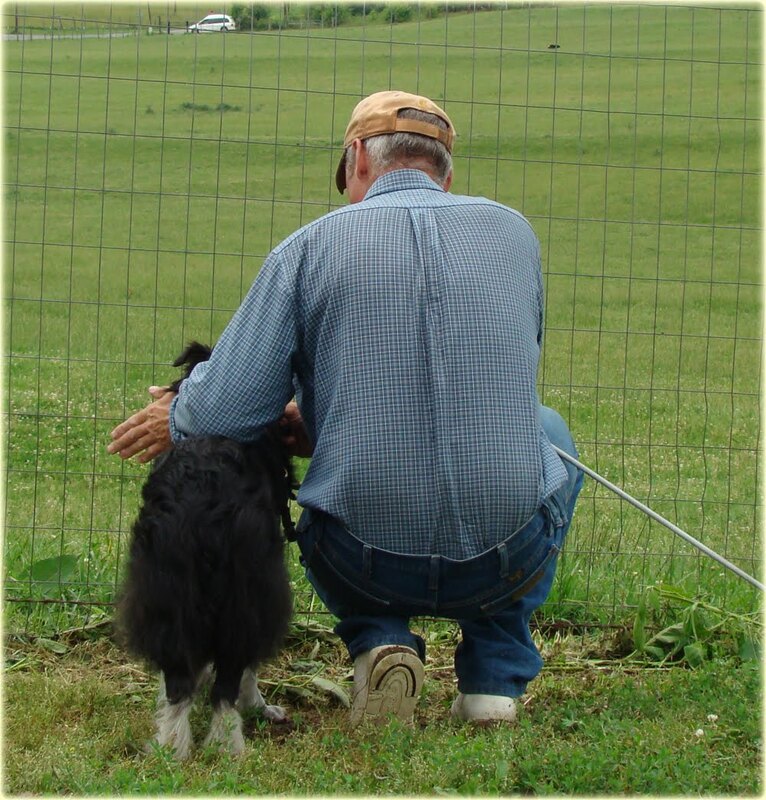 We were hoping for more with the nursery dogs but this was their first time away from home and it was a little much for any dog. June and Reba did well for their first time out. Neither placed but almost. 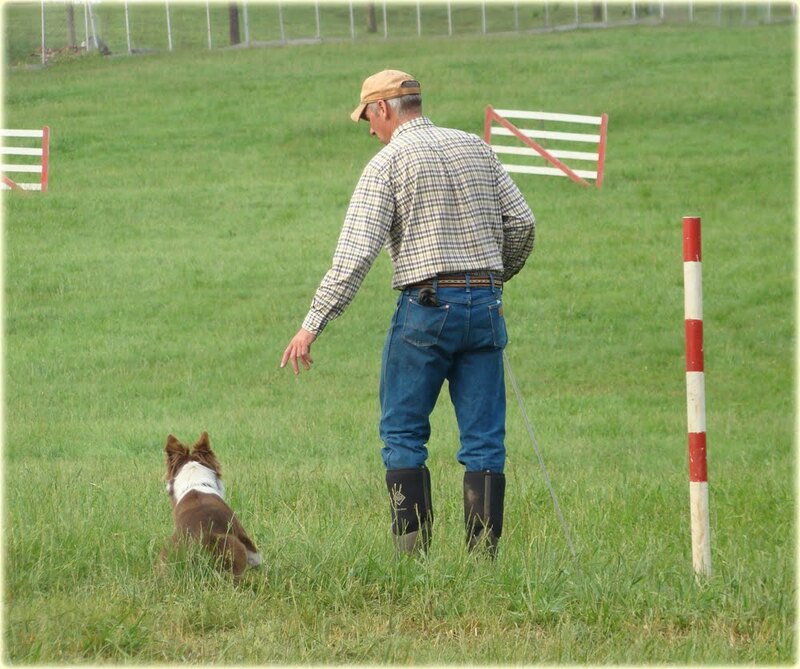 June had a crazy fetch with them running down the right side of the field, hoping to make a break for set out but once they got to Scott's feet they settled down and she had a nice drive but no pen. 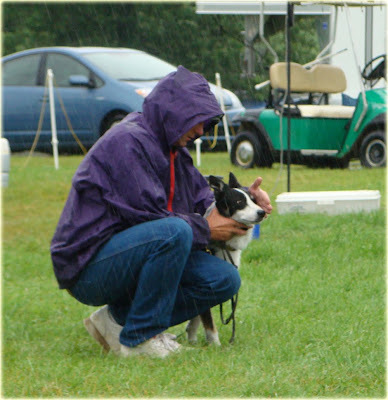 She was5th with a 61 but only 3 dogs qualified. Reba would have qualified if she hadn't seen something on the left that she was sure was sheep. She crossed on her outrun but once she got to the top she really did well and ended up with a 7th place and a 48 with no pen. Syn tried to come in early on her outrun and I had to shout her out. 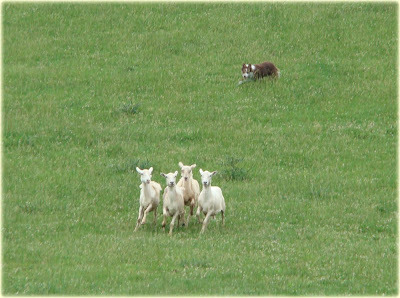 Unfortunately, this hurt her feelings and when the sheep broke to my right to the set out, she didn't put the afterburners on and lost them. Joni Swanke's Sage was heads and tails above the rest and ran an 84.